I wondered if everything was alright as I had not heard from you for a while. I am glad that you are getting better and sorry that you were sick! I sometimes forget to take care of myself as well…It does not usually bode well in the long run, but always seems to be a hard lesson to learn. As I was sick twice this spring…once with a sinus infection, and then with a bad sore throat and cough…I can so totally relate…I know it’s God’s way of forcing me to slow down, but it does frustrate me to get nothing done!! I did get some reading done though, which I miss since I’ve been working part-time this year! Praying for you to get better, so you can take care of your adorable chicks…and keep the posts coming!! God Bless!! Yes, I’m better now…thanks…and seem to have gotten my energy back…thank God!! Teaching this year 3 days/week at a small Christian school…in elementary grades. I’m used to middle school/high school kids, so it’s challenging…next year I’ll be much stricter! Ha! Sounds like you chasing after your little chicks…is what I seem to be doing all day, too!! It’s exhausting! Take good care of yourself and your sweet chicks!! Glad you are on the road to recovery. 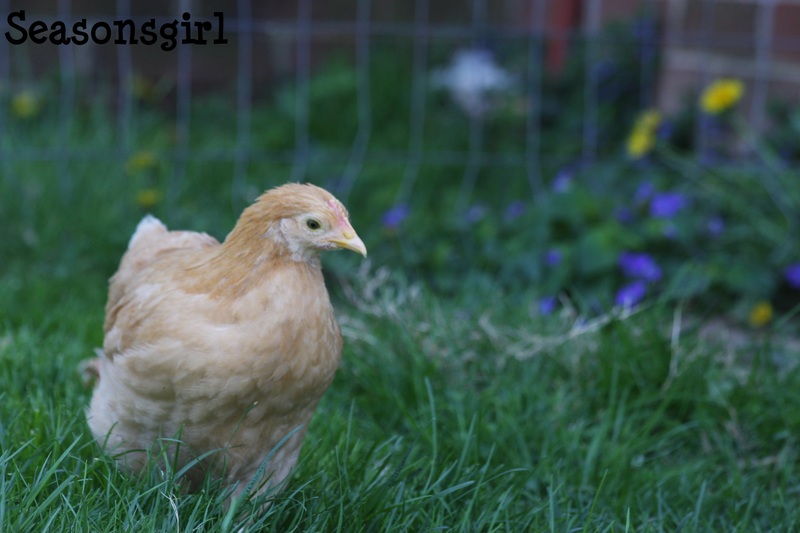 Watching chicks and chickens co exist is like watching kids play and awaiting the bully to present herself. Currently, we have one very friendly Australorp in a pen by herself because she was picked on to the point that we thought we might lose her. She’s getting healthier and growing her feathers back but now we have a second Australorp that is looking like she is going down the same path. I am sorry you have been sick, I will be praying for you. Love your chicks, they are so sweet. Hope you feel better today. Feel better soon! So funny that one can get out but no-t in– such silly girls! Must be the change in seasons and temperature, Seasonsgirl. Sorry to hear you’re not well. Take it easy and get lots of rest. Drink lots of warm beverages to help break up the phlegm. No fun I know and staying in bed gets real old, real fast. Hope you have a TV in your bedroom and if not, lots of fun magazines. I’m sure you won’t be down long and I hope your babies get welcomed into the flock without too much fuss. But you know hens, they like a fuss everynow and then. Get well fast so you can enjoy the nice sunny weather, if you have it. Sounds like you are doing all the right things. And I understand what it is to be in bed too long. After awhile, you get a bit tired of your bed and you are too far away from all happenings in your household. Take it easy till you feel 100% better. Not much sunshine here, just lots of overcast and rain. I look forward to sunshine and only sunshine. Thanks for the visit and sorry to see you’ve been unwell! I’d love to know how your old flock/new flock intro goes. We have one surviving chicken from our original flock and when these new girls grow up, we’re a little unsure how to combine everyone! Thank you for the well wishes 🙂 I am feeling 85-90% better now and hope to be at 100% soon 🙂 The chicks are getting more active and loving being outside. They don’t seem to be growing too quickly (but I see them every day and want to keep them little 😉 ), but I do hope they get a little bigger as I still worry about a hawk getting them as they are still small enough.